Designed to excel in the most demanding settings, the SH960 boasts an energy-efficient dual-lamp system to achieve a stunning Full HD projection with 5500 ANSI lumen ultra-high brightness and 3000:1 contrast. With two lamps at work, presentations can be carried on without interruption. A unique dual-lamp system is adopted for the SH960 to deliver impactful presentations with 5500 ANSI lumen ultra-high brightness. With two lamps at work, presentations can be carried on without interruption –If one lamp goes out, the other lamp will simply work harder to perform with optimum brightness. 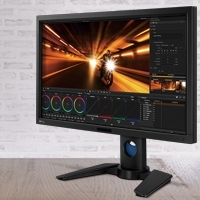 The SH960 offers the highest standard of viewing – a Full HD resolution at 1080p. 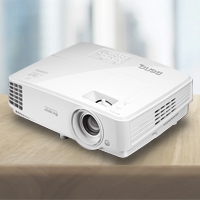 It supports multiple video formats including 480p, 576p, 720p, 1080i and 1080p, delivering 5 times more detail than traditional 480p projectors. With Full HD, every viewing experience becomes more absorbing. Boasting a high contrast ratio of 3000:1, the SH960 translates image with razor-sharp details defined by a broader range of subtle color differences. As a result, text is sharper, cleaner and easier to read. A sophisticated image-processing engine, HQV converts standard definition (SD) and regular HD video sources to Full HD-like image quality with 80% precisely scaled picture quality. HQV works with both analog and digital video sources. In case of any minor miscalculations to take place during the projector installation, the lens shift function can be used to adjust the position of the projected image to fit the projection screen. This adjustment can be made by using the switch next to the projector lens, the key pad on the projector or the remote control. LAN Control enables IT managers to perform day-to-day projector maintenance and repair tasks efficiently and effectively. With full access and control over every projector directly from their workstations, IT managers get to save energy, time and money. 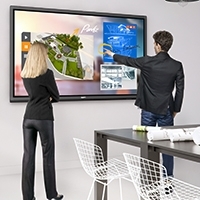 The BenQ SH960 offers seamless support for a variety of LAN Control settings – whether it's Crestron, PJ-Link or SNMP. And, all you need is a LAN cable to set things up. * ISO21118 based measurement. **Lamp life results will vary depending on environmental conditions and usage.